Habit: Deciduous shrub or tree to 8 m (26 ft) and as wide. 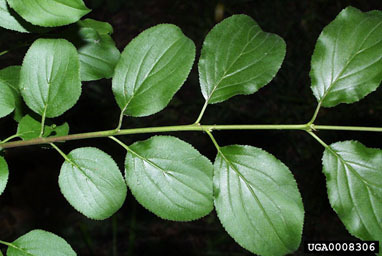 Reproduction: Primarily by seed; may sucker from base; dioecious. Leaves: Elliptic to oblong/obovate, 3-7 cm (11⁄4-23⁄4 in); twice as long as wide; pinnately veined, lateral veins curv­ing upward; opposite, some alternate, often abruptly pointed with rounded teeth (each bearing a gland) on the margin; upper surface dark green, lower light green; yellow/brown in fall; downy beneath if young; early leaf-out, late senescence; leaf lifespan exceeds that of native shrubs by 58 days. Stems: Branches opposite (or nearly) at right angles to trunk; some twigs end in a short thorn; grayish/yellowish-brown, glabrous; trunk becomes scaly with age. Flowers: Male 2-6 per cluster with 4 yellowish-greenish petals and sepals, 4 stamens; female 2-15 per cluster, usually without petals, if present, linear and yellowish-brown, 4 vestigial stamens, 4 green sepals shorter than those in the male; April-June; appear with the leaves; females at a 6 to 1 ratio to males; honey-scented; calyx tube with nectarial lining; insect pollinated (bees and flies). 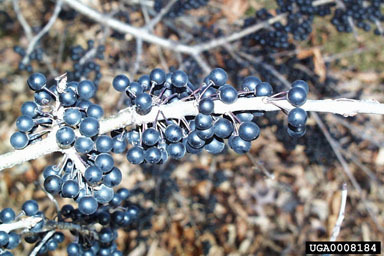 Fruits/Seeds: Glossy black at maturity in late summer/ early fall; fruit 0.5 cm (1⁄4 in) in diameter; drupe contains 3-4 seeds; cold stratification may or may not be required; optimal germination at 20 or 30ºC (68 or 86ºF); most fruit falls beneath females; bird dispersed, but not preferred (even in native habitat); seedling establishment more likely on ground with little herb cover; dormancy and seed bank still unclear. Habitat: Native of Eurasia; introduced into the U.S. in 1880s; on calcareous soils in native habitat; open/shaded areas, roadsides, woodlands, riverbanks (not flooded), pastures, and mature forests; tolerates various soil conditions. Comments: An alternate host for oat crown/leaf rust and an overwintering host of soybean aphid; early leaf-out more important than late senescence for carbon gain; growth rates higher in light; leaves decompose more rapidly than some natives and are high in nitrogen; USDA hardiness zones 3-7. Similar Native Species: R. caroliniana; flowers perfect and in parts of 5; leaves alternate.